Hello crochet friends, today I decided to bring a pattern to you and also bring several very useful and legal tips. Today the post goes to moms or to those who have nephews, cousins of babies who want to make gifts or even to those who sell crochet pieces and have to have children's clothes, as it is one of the things that sells more quilts, carpets and shawls Therefore, we must always be attentive to demand and news. I hope you enjoy it, but who does not like a piece of baby is not. Today, the crochet pattern is about the baby's body made of crochet. It is very cute and is the most beautiful thing in them. 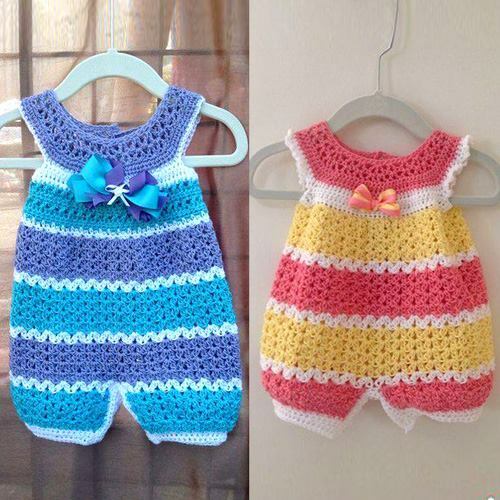 This crochet tip is great for anyone who wants to learn new patterns and make for their children or relatives, baby crochet clothes gets very delicate so let's learn how to make this body and also we decided to leave some tips on baby clothes to be more useful yet for you. Knowing new patterns is never too much, and what we should not do is to stay still and behind schedule. So let's go. 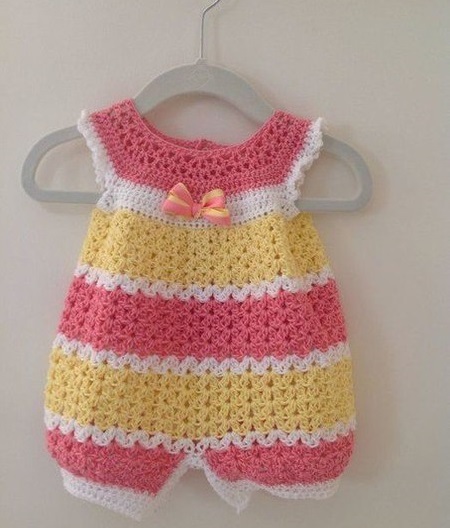 Let's learn a baby crochet overalls to give away or sell. Crochet crafts require few materials like yarns and hooks and with this we can do without spending a lot and have more return on their sale. This pattern is very simple and with practice is getting faster and faster and it is smooth so you can also decorate as you want. I am going to make this pattern in pink and white for my goddaughter who is about to be born in May and I am already looking forward to the arrival. I'm sure she'll look beautiful in this dress made even more by me, a gift made by my hands with a lot of love and care. I'll leave some tips to help you even more. At the time of washing your baby's parts, we must take care not to ruin, and with crochet pieces is no different also needs redoubled care so it does not spoil and do not lose shape or shred. Because the baby clothes are very delicate they should be washed by hand. Why the movement of the washing machine can affect the yarn's fiber by loosening and deforming the piece you made so carefully. The best thing to wash is the neutral soap as it cleans deeply and does not damage how it can happen if you use the laundry soap. It is important to wash clothes before putting on the baby for the first time. It may be with dust or some substance in the wires because of factory production or transportation. And it can even cause allergy to the skin, so it is important to wash. The crochet pieces can not be placed on clothes hangers because the clothes will stretch and lose their shape so they will not give more to wear. Should always keep folded. Do not put your crochet pieces in a clothes dryer as they may shrink and lose their shape because of hot air and damaging the line. It is also important not to twist the part and not to use a catch because it will leave marks on the baby's clothes, the right thing is to carefully squeeze the piece or let it dry somewhere in the horizontal and always put in place with shade or wind never in the sun not to screw up. If you liked our tips and also the pattern do not waste time, do it now and please everyone. 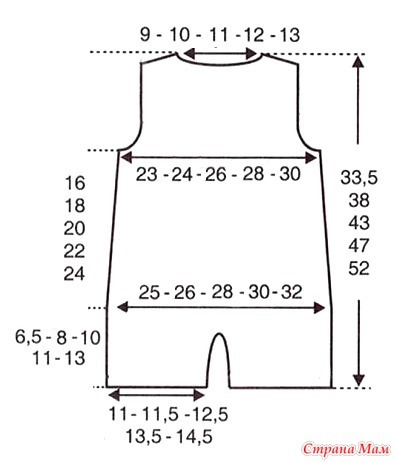 Below I made available the graphic of this pattern and also the link of a pattern with more information. Make beautiful pieces and enjoy our fanpage Xell Crafts and stay inside our news.